As promised, the savory muffins from the other half of my half-two-recipes-at-the-same-time muffin baking adventure. The inspiration for baking both the Orange Cranberry Rosemary Muffins and these Cheddar Chive Muffins was my herb garden. Each year, I plant a small selection of herbs in pots on my deck. Having fresh herbs on hand to cook with is one of my favorite things about summer. Oh sure, you can buy them in most stores year round, but they’re expensive (compared to growing your own) and you can’t beat the flavor of fresh picked herbs. But inevitably I end up with way more herbs than I know what to do with. The sweet Orange Cranberry Rosemary Muffins were a great way to use some of my flourishing rosemary. 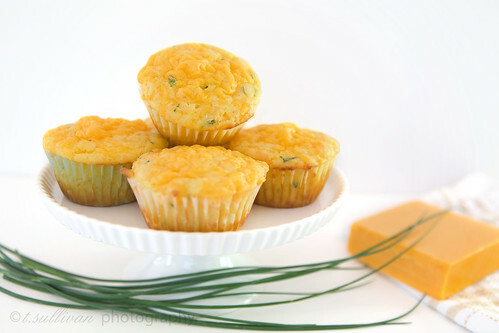 And these savory Cheddar Chive Muffins? Fantastic excuse to use some of my chives. Did I mention I never planted chives this year? I didn’t use them much last year, so I skipped planting them in the Spring… only to have them come back to life all on their own! You can’t ignore that kind of tenacity. The chives demanded to be used, and who am I to let them down? If you don’t have chives, don’t worry! These muffins are very adaptable and would be great with a lot of other herbs, or even a variety of them. You could try parsley, dill, or thyme, not to mention non-herb additions like sun-dried tomatoes or bacon. They’re the perfect compliment to soups and salads, and they make a great snack all on their own. Preheat the over to 375°F. Lightly grease or line a 12-cup muffin tin. In a medium bowl, measure flour, sugar, baking powder and salt. Whisk until combined. Stir in the shredded cheese. In a smaller bowl, combine egg, milk, and melted butter. Pour wet ingredients into dry ingredients and stir until just combined. Fold in herbs and other mix-ins. Divide the batter among 12 muffins cups. Bake at 375°F for 20-25 minutes, or until the center springs back when lightly poked. These look absolutely amazing! They’re definitely going on my list of things to try. Yum! I am thinking these must be sooo delicious!